RUSSIAN President Vladimir Putin has won a landslide re-election victory, extending his rule over the world's largest country for another six years at a time when his ties with the West are on a hostile trajectory. The vote was tainted by widespread reports of ballot-box stuffing and forced voting, but the complaints will likely do little to undermine Mr Putin. His thumping victory overnight will extend his total time in office to nearly a quarter of a century, until 2024, by which time he will be 71. Only Soviet dictator Josef Stalin ruled for longer. Mr Putin has promised to use his new term to beef-up Russia's defences against the West and to raise living standards. 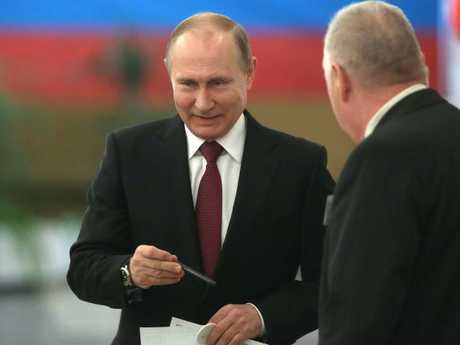 In a widely-expected result, an exit poll by pollster VTsIOM showed Putin, who has already dominated the political landscape for the past 18 years, had won 73.9 per cent of the vote. Backed by state TV, the ruling party, and credited with an approval rating around 80 per cent, his victory was never in doubt. None of the seven candidates who ran against him posed a threat, and opposition leader Alexei Navalny was barred from running. 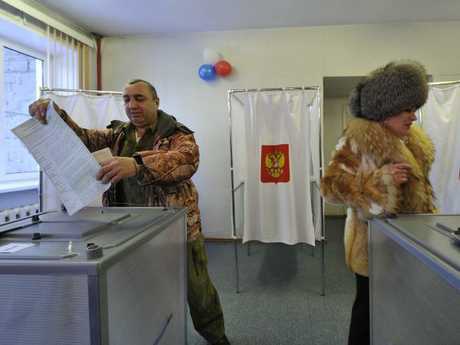 Russia's Central Election Commission recognised that there were some irregularities but was likely to dismiss wider criticism and declare the overall result legitimate. "I think that in the United States and Britain they've understood they cannot influence our elections," Igor Morozov, a member of the upper house of parliament, said on state television. "Our citizens understand what sort of situation Russian finds itself in today." The longer-term question is whether Mr Putin will soften his anti-Western rhetoric now the election is won. Mr Putin, 65, has been in power, either as president or prime minister, since 2000. Allies laud the former KGB agent as a father-of-the-nation figure who has restored national pride and expanded Moscow's global clout with interventions in Syria and Ukraine. The vote was tainted by widespread reports of ballot-box stuffing and forced voting, but the complaints will likely do little to undermine Mr Putin. 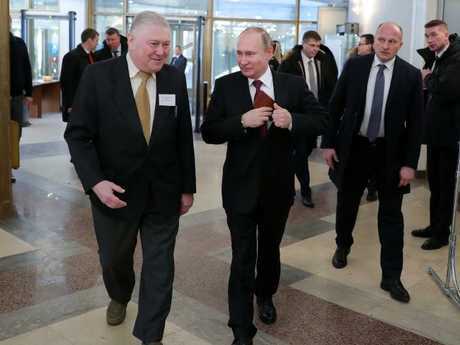 The Russian leader's popularity remains high despite his suppression of dissent and reproach from the West over Russia's increasingly aggressive stance in world affairs and alleged interference in the 2016 US election. Mr Putin's main challenges in the vote were to obtain a huge margin of victory in order to claim an indisputable mandate. 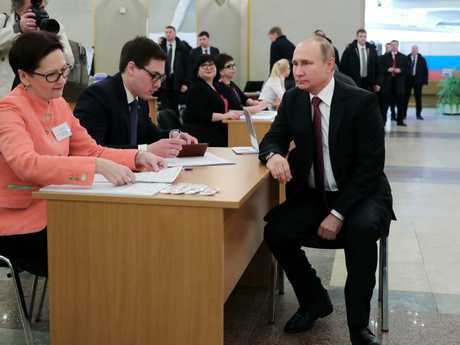 The Central Elections Commission said Mr Putin had won about 72 per cent of the vote, based on a count of 22 per cent of the country's precincts. Russian authorities had sought to ensure a large turnout to bolster the image that Mr Putin's so-called "managed democracy" is robust and offers Russians true choices. He faced seven minor candidates on the ballot. Mr Putin's most vehement and visible foe, anti-corruption campaigner Alexei Navalny, was rejected as a candidate because he was convicted of fraud in a case widely regarded as politically motivated. Mr Navalny and his supporters had called for an election boycott but the extent of its success could not immediately be gauged. The election came amid escalating tensions between Russia and the West, with reports that Moscow was behind the nerve-agent poisoning of a former Russian double agent in Britain and that its internet trolls had mounted an extensive campaign to undermine the 2016 US presidential election. Britain and Russia last week announced diplomat expulsions over the spy case and the United States issued new sanctions. Russian officials denounced both cases as efforts to interfere in the Russian election. But the disputes likely worked in Mr Putin's favour, reinforcing the official contention that the West is infected with "Russophobia" and is determined to undermine Mr Putin and Russian cultural values. Mr Putin has come to embody Russia's exceptionalism, the sense of the state and culture as an extraordinary entity that is nonetheless under constant attack from outside. Crimea and Russia's subsequent support of separatists in eastern Ukraine led to an array of US and European sanctions that, along with falling oil prices, damaged the Russian economy and slashed the rouble's value by half. But Mr Putin's popularity remained strong, apparently buttressed by nationalist pride. In his next six years in office, Mr Putin is likely to assert Russia's power abroad even more strongly. Just weeks before the election, he announced that Russia has developed advanced nuclear weapons capable of evading missile defences. 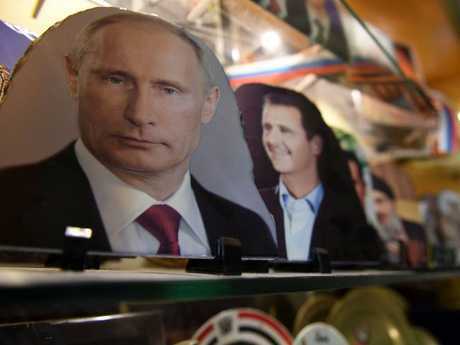 The military campaign in Syria is clearly aimed at strengthening Russia's foothold in the Middle East. Russia eagerly eyes possible reconciliation on the Korean Peninsula as a lucrative economic opportunity. At home, he will be faced with how to groom a successor or devise a strategy to circumvent term limits, how to drive diversification in an economy still highly dependent on oil and gas and how to improve medical care and social services in regions of the sprawling country far removed from the modern glitter of Moscow. 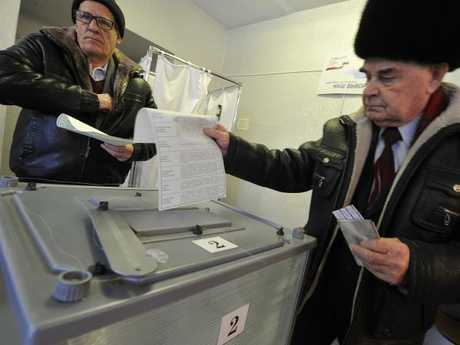 Casting his ballot in Moscow, Putin was confident of victory, saying he would consider any percentage of votes a success. 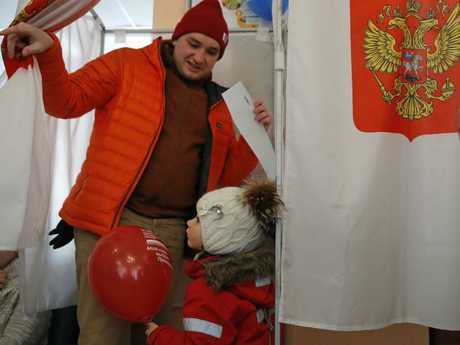 About 107 million Russians were eligible to cast ballots and turnout was nearly 60 per cent an hour before polls closed in Moscow at 5pm local time (1am AEDT) according to figures displayed in the central electoral commission information centre. 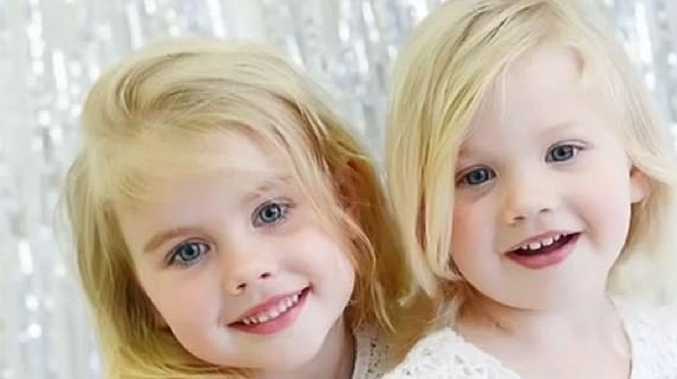 Authorities pulled out all the stops to boost participation, with selfie competitions, cheap or free food and entertainers organising games for children at polling stations. 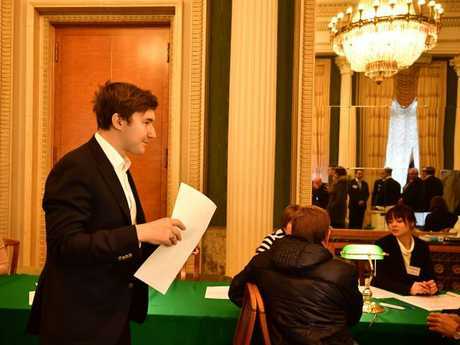 Employees of state and private companies reported coming under pressure to vote, while students have been threatened with problems in their exams or even expulsion if they do not take part, according to the opposition-leaning Novaya Gazeta newspaper. Mr Navalny, who oversaw a campaign for a vote boycott and sent over 33,000 observers across the country with manual counters to see how official turnout figures differ from those of monitors, said there had been "unprecedented violations". Mr Putin, who has run under the slogan "a strong president - a strong Russia", declined to take part in televised debates and shot no new material for his own campaign advertisements. 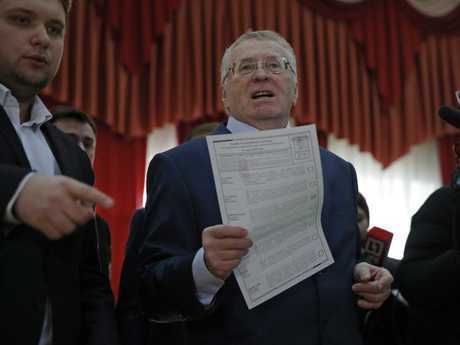 One of the more memorable moments from the campaign came during a debate when Sobchak threw a glass of water over the ranting ultranationalist candidate Vladimir Zhirinovsky, prompting him to call her a "prostitute" and a "mad fool". Since first being elected president in 2000, Mr Putin has stamped his total authority on the world's biggest country, muzzling opposition, putting television under state control and reasserting Moscow's standing abroad. The 65-year-old former KGB officer has sought to use the campaign to emphasise Russia's role as a major world power, boasting of its "invincible" new nuclear weapons in a pre-election speech and continuing Moscow's support for the Syrian regime in a bloody civil war. "I am sure the program I am offering is the right one," said the man who is already Russia's longest-serving leader since Stalin. Most people who spoke to AFP said they voted for Mr Putin, praising him for lifting the country out of the post-Soviet quagmire. "After he brought Crimea back, he became a hero to me." Sunday marks four years since Putin signed a treaty declaring Crimea to be part of Russia in a move that triggered a pro-Kremlin insurgency in east Ukraine, a conflict that has claimed over 10,000 lives. Ahead of the vote, a new crisis broke out with the West as Britain implicated Mr Putin in the poisoning of former double agent Sergei Skripal with a Soviet-designed nerve agent. Mr Putin's previous Kremlin term was marked by a crackdown on the opposition after huge protests, the Ukraine conflict, military intervention in Syria and the introduction of Western sanctions that contributed to a fall in living standards. 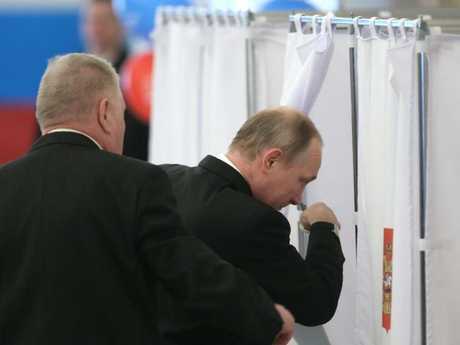 State-run pollsters predict Putin will take about 70 per cent of the vote, with the independent Levada Centre - branded a "foreign agent" -- barred from releasing any polls. "I will not go to vote. What for?" 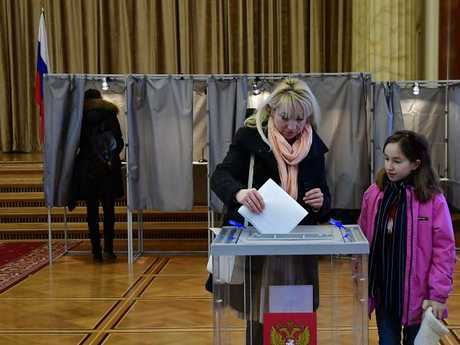 Boris Limarev, a 39-year-old manager, said as he walked his dog near a polling station in Saint Petersburg. "It's clear to everyone who will be elected." "And the rest of the candidates are clowns," interjected his wife Anna, 35. "Another six years of slavery," said a piece of paper made up to look like a ballot which was spotted on a Moscow street - in an apparent reference to Mr Putin's next term. Mr Putin's Kremlin-approved challengers include millionaire communist Pavel Grudinin and former reality TV host Ksenia Sobchak, but none was expected to win more than seven per cent. Election officials flew to far-flung regions to collect votes from indigenous herders, while cosmonaut Anton Shkaplerov - the only Russian currently aboard the International Space Station - cast his ballot by proxy. 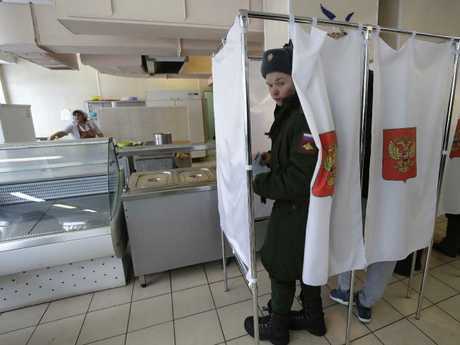 With the vast country stretching across 11 time zones, polls close in Kaliningrad, the exclave on the EU border was the last province to cast their votes, as official results were issued throughout the night.